Adaption and Evolution are the two necessary ingredients for any business to succeed. But what they need to keep up with the growing trends? The digital fascination in today’s era is imposing a challenging question for the startups: how to sustain a business from failing because of innovation? One thing that can help the businesses get an extra edge is having a mobile app for its customers. Technology is expanding… and so is the business!!! The traditional approach like handing out leaflets, printing advertisements, and the hanging billboard is an age-old way solution to establish a connection with the customers and cannot succeed in today’s world. Hence it is necessary to have a mobile app for streamlining workflow and reaching their customers effectively. 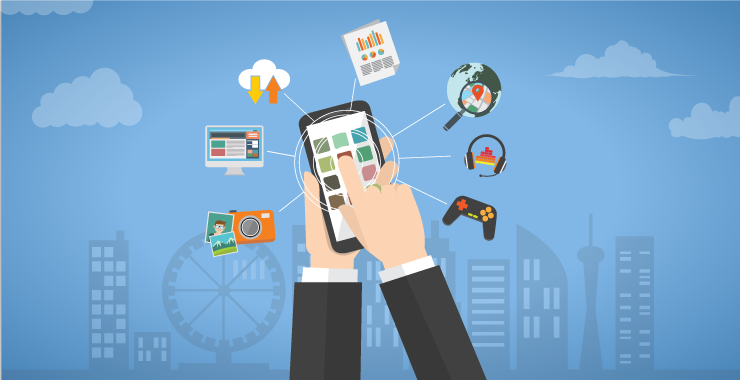 Mobile apps serve as a platform for your business to expand and reach global avenues. Moreover, custom mobile app development ensures that your brand’s voice is heard by a targeted audience and geared towards your business goals. Some of the popular brands like Zara, Starbucks, and Domino’s Pizza etc. prove that mobile app development can considerably help to boost sales. When Zara developed a mobile app, their sales increased over 60%. Rebecca Minkoff launched a mobile app and observed 3 times increase in sales of apparels. Domino’s Pizza online sales grew by 28% in the UK after releasing the app. Cultivates Brand Loyalty: If the business wants to retain their customers and capitalize their digitally savvy behavior, they must build a compelling mobile presence through apps. Creative and unique mobile apps help the brands to connect and engage with the customers and help to stand tall amongst the crowded marketplace. By using the loyalty campaigns, offering discounts, using geo-fenced pushed notifications, brands can have a strong foundation of their customer base. For instance: Starbucks is the best example of in-app based loyalty programs as it provides loyalty award stars as in-app points. If the customer is registered at Star Bucks; have La Boulange or Teavana card and earns sufficient points, they can get a free drink. This Starbucks mobile loyalty app presents personalized service and because of this reason, it is highly admired by the customers. Builds Brand Recognition: The more the audience trusts you, more likely they will listen to your sales pitches and even commit to your brand. Mobile app development will provide you an opportunity to demonstrate your users, why they should trust your brand. Developing user friendly mobile app with intuitive features will help the customers to get involved in your app. And when the customer thinks of a product or service, your business will be the first they recall. Connects you with on-the-go customers: People always seem to be on the go… Going to work… Going to the gym… Going to a café and much more. They may not have access to the laptops or desktop when they are traveling but they always have their smart-phone with them. Today most of the people are active on their mobile phones and having a mobile app gives you the opportunity to showcase your brand anywhere across the globe. One of the recent researches reveals that, adult people spend about 3 and half hours a day using various apps! This means through a mobile app you can convert your app visitorts into loyal customers and connect with them whenever they are on-the-go. Personalization makes user feel special: By offering mobile apps to the customers, a business can establish an emotional bond with their customers… How? With the help of personalization! By knowing customer’s likes, dislikes, their shopping habits, wish lists, shopping carts etc. you can send them personalized offers and show your care towards them. Amalgamating behavioral data and profile data gives you an ability to offer personalization to your customers through offers and discounts. With tailored content, you are more likely to meet the specific needs of your audience and convert them into frequent users. Boosts Profits: When customer satisfaction builds up, it results into increased sales. As per the research, buying experiences are influenced by how customers are being treated. The more your customers will be pleased, the more they will be inclined to visit your app and make a purchase. This increase in demand is going to provide you some serious returns. If you launch a mobile app, in addition to your responsive website, you’ll see a significant increase in sales while also enhancing customer experience. Example to follow: When Domino’s Pizza developed a mobile app for ordering delivery or in-store pickup of their food, they saw an e-commerce growth of 28 percent in the first six months in the UK. In fact, mobile devices now account for 77 percent of their online orders. With the help of a mobile app you can increase your brand’s visibility. With advanced features, user-friendly app interface and optimum app performance, your app will do wonders for your business. We at TOPS Infosolutions have expert developers to address your custom needs for mobile app development for both the popular platforms – iOS and Android. Get in touch with us today to discuss your mobile app requirements.